A lawsuit against a PG&E power plant in Antioch aims to protect the rare and endangered species. The Lange's Metalmark butterfly can't catch a break. Existing nowhere in the world but a fifty-acre strip of sand along the San Joaquin River in Antioch, the endangered species has teetered just above the extinction line for decades. 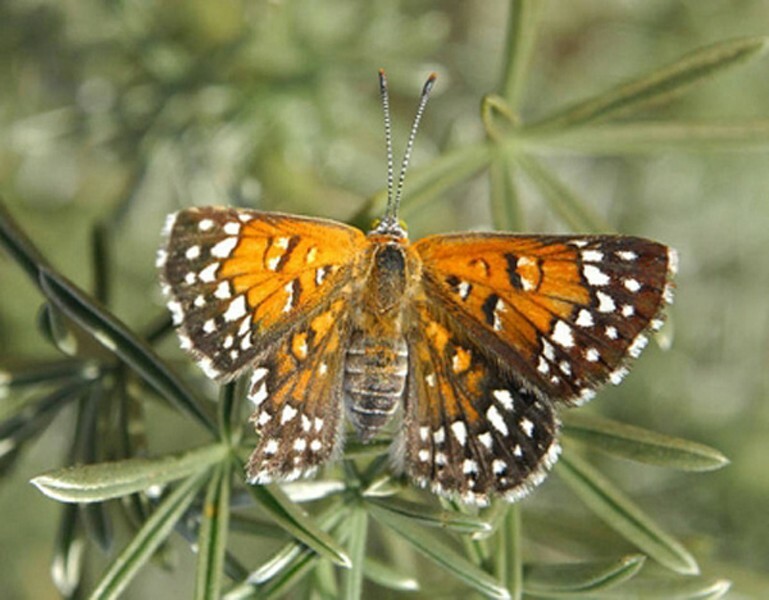 Scientists blame development pressures and invasive species for all but decimating the colorful butterfly, but now there's another ill to add to the list: a cluster of fossil-fuel power plants surrounding the refuge in eastern Contra Costa County. The last five or so years have seen an explosion of research showing how nitrogen deposits affect plants and animals, said Brent Plater, president and executive director of San Francisco environmental nonprofit Wild Equity Institute. Scientists now understand that nitrogen emitted by cars and power plants can have a harmful fertilizing effect on nutrient-poor soils like those at the Antioch dunes, resulting in a more hospitable environment for non-native plant species. This discovery may help to explain the preponderance of invasive weeds on the refuge that are choking out native naked-stemmed buckwheat, the sole food plant for Lange's Metalmark larvae. "As the population of the buckwheat goes, so goes the population of the Lange's butterfly," Plater said. In 1980, the Antioch dunes became a national wildlife refuge, the first in the country designated for the protection of an insect. But that didn't stop the butterfly's population from dwindling to a mere 154 by 1986. The number climbed to 2,342 in 2000 — a big improvement, although a far cry from the estimated 250,000 Lange's Metalmarks a century ago — but fell again in 2006 to an all-time low of 45. More recently, after extensive efforts to restore the butterfly, which provides food for native birds, lizards, mice, wasps, and many others, the population has only hovered around 150. "Once you start dumping a bunch of nitrogen into the soil, the chemical composition of the soil changes and so it favors certain kinds of plants over others," Plater explained. Now, he hopes that the link between emissions, nitrogen, buckwheat, and butterflies can be used to help pull the Lange's Metalmark from the brink of extinction yet again. In fact, the connection provides the backbone for a lawsuit that may prove key in determining the future of the butterfly. Less than a mile from the Antioch Dunes National Wildlife Refuge is a 530-megawatt natural gas-fired PG&E power plant that Plater argues is operating without legally mandated consideration of its impacts on the federally protected insect. The lawsuit was first filed against PG&E in March 2010 by Communities for a Better Environment, an Oakland-based environmental justice organization. Staff attorney Adrienne Bloch, who is arguing the case, says that the power plant, known as the Gateway Generating Station, was never properly permitted. Its past is indeed a bit murky. PG&E purchased the unfinished plant in 2006, after construction and air pollution permits acquired in 2001 by rival energy company Mirant Corporation had expired. According to Bloch, PG&E applied for a new permit, finished construction, then withdrew its application and began operating anyway. After community groups objected, the Environmental Protection Agency sued PG&E for operating without a permit, then agreed to a consent decree that reinstated the original 2001 permits. That's when Communities for a Better Environment intervened. "It's outrageous. They managed to skip the entire permitting process," Bloch said. "Our position is that the consent decree sets a terrible precedent. It would be terrible if power plant proponents would think they could just build their power plants without permits, and then get a sweet deal later." Late last year, nine months after the original lawsuit was filed, the Wild Equity Institute filed a notice of intent to join the litigation. The institute's allegations took the suit one step further by introducing an effort to protect the Lange's Metalmark butterfly. Plater, who also is serving as the organization's attorney, argues that by not performing a complete permitting process, the Environmental Protection Agency sidestepped an Endangered Species Act mandate to consult with the US Fish and Wildlife Service about the butterfly. If the EPA had done so, he said, scientists' improved understanding of the power plant's impacts on the butterfly would have resulted in more stringent emissions limits and additional nitrogen mitigation measures. PG&E, which did not return phone calls seeking comment for this story, has not publicly contested the two organizations' timeline of events. Rulings on both organizations' claims may come as soon as Friday, February 25, when the case will be heard in San Francisco federal court. The judge's decision could hold serious implications for the future of the Lange's Metalmark butterfly — especially considering that at least three new power plants have recently been proposed to join the more than ten already operating in the Antioch/Pittsburg/Oakley area. "It's the kind of risk that puts a pit in your stomach when you're dealing with a species on the brink of extinction," Plater said. "It's a race against time. If we lose time, the butterfly could be gone by then."